After a successful campaign producing marketing guides for small business owners, it was time for a new approach for Simply Business. The client wanted to gain attention in the tech startup scene. Acquisitions are a popular topic in this niche. The large tech firms like Google and Facebook frequently buy up smaller companies for their intellectual property, technology, and talent. And attaching the big names in tech to your content can often help it get covered. 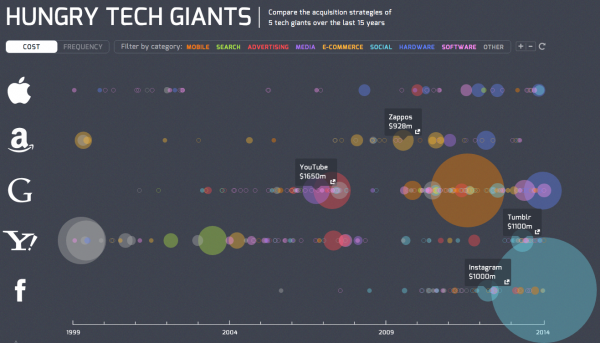 So we decided to show all the companies that Apple, Facebook, Google, Amazon and Yahoo have acquired over the years. But the real hook of the piece just fell into our laps. 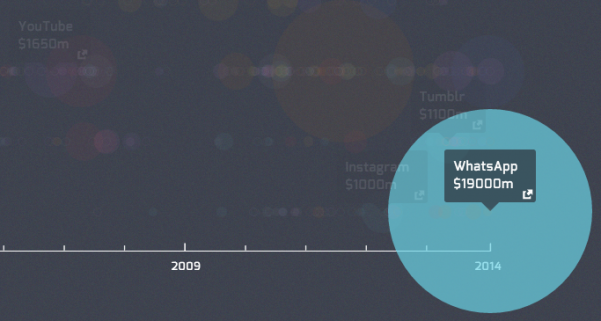 Right before we were about to launch, Facebook acquired WhatsApp for a record $19 billion. We quickly added the new data point (the largest in the dataset) and launched the interactive.